The Insider Monkey team has completed processing the quarterly 13F filings for the December quarter submitted by the hedge funds and other money managers included in our extensive database. Most hedge fund investors endured a torrid quarter, which certainly propelled them to adjust their equity holdings so as to maintain the desired risk profile. As a result, the relevancy of these public filings and their content is indisputable, as they may reveal numerous high-potential stocks. The following article will discuss the smart money sentiment towards Targa Resources Corp (NYSE:TRGP). Is Targa Resources Corp (NYSE:TRGP) going to take off soon? The smart money is taking an optimistic view. The number of bullish hedge fund bets increased by 14 in recent months. Our calculations also showed that TRGP isn’t among the 30 most popular stocks among hedge funds. We’re going to take a peek at the fresh hedge fund action surrounding Targa Resources Corp (NYSE:TRGP). What have hedge funds been doing with Targa Resources Corp (NYSE:TRGP)? At the end of the fourth quarter, a total of 35 of the hedge funds tracked by Insider Monkey were long this stock, a change of 67% from the previous quarter. 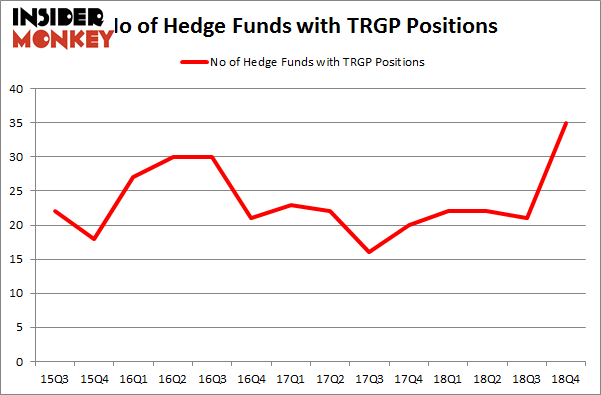 The graph below displays the number of hedge funds with bullish position in TRGP over the last 14 quarters. With hedge funds’ positions undergoing their usual ebb and flow, there exists an “upper tier” of key hedge fund managers who were boosting their holdings meaningfully (or already accumulated large positions). More specifically, Zimmer Partners was the largest shareholder of Targa Resources Corp (NYSE:TRGP), with a stake worth $92.1 million reported as of the end of September. Trailing Zimmer Partners was Point State Capital, which amassed a stake valued at $51.9 million. Renaissance Technologies, Point72 Asset Management, and Millennium Management were also very fond of the stock, giving the stock large weights in their portfolios. With a general bullishness amongst the heavyweights, specific money managers have been driving this bullishness. 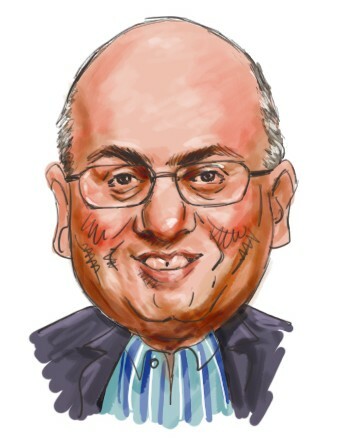 Point72 Asset Management, managed by Steve Cohen, assembled the biggest position in Targa Resources Corp (NYSE:TRGP). Point72 Asset Management had $44.8 million invested in the company at the end of the quarter. Matt Smith’s Deep Basin Capital also initiated a $30.9 million position during the quarter. The other funds with new positions in the stock are Alec Litowitz and Ross Laser’s Magnetar Capital, Steve Pattyn’s Yaupon Capital, and Matthew Tewksbury’s Stevens Capital Management. Let’s also examine hedge fund activity in other stocks – not necessarily in the same industry as Targa Resources Corp (NYSE:TRGP) but similarly valued. We will take a look at Camden Property Trust (NYSE:CPT), Albemarle Corporation (NYSE:ALB), Amdocs Limited (NASDQ:DOX), and Alliance Data Systems Corporation (NYSE:ADS). This group of stocks’ market valuations match TRGP’s market valuation. As you can see these stocks had an average of 27.5 hedge funds with bullish positions and the average amount invested in these stocks was $712 million. That figure was $485 million in TRGP’s case. Alliance Data Systems Corporation (NYSE:ADS) is the most popular stock in this table. On the other hand Camden Property Trust (NYSE:CPT) is the least popular one with only 19 bullish hedge fund positions. Targa Resources Corp (NYSE:TRGP) is not the most popular stock in this group but hedge fund interest is still above average. This is a slightly positive signal but we’d rather spend our time researching stocks that hedge funds are piling on. Our calculations showed that top 15 most popular stocks among hedge funds returned 21.3% through April 8th and outperformed the S&P 500 ETF (SPY) by more than 5 percentage points. Unfortunately TRGP wasn’t in this group. Hedge funds that bet on TRGP were disappointed as the stock returned 14.3% and underperformed the market. If you are interested in investing in large cap stocks, you should check out the top 15 hedge fund stocks as 12 of these outperformed the market.